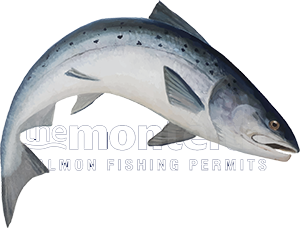 Before you embark on fishing any salmon river whether it be for the very first time or even if you have been salmon fishing for decades it is worth pondering on some of the following points just to make sure you are not missing any vital components that could diminish your chances of catching salmon. When you’re buying access to a salmon beat take a closer look at the actual catch statistics which are so heavily marketed these days and try to figure out via the typical rod availability roughly how many rods were likely to have been fishing to achieve what ever these ‘surface’ stats show. Personally I completely disagree with catch stats being used as a sales tool to sell a completely natural pursuit like salmon fishing as on naturally occurring down cycles it often does huge harm to a salmon beat’s annual revenue stream by discouraging salmon fishers to buy fishing which then becomes a ‘self fulfilling prophecy’ as few turn up to cover the water. In the old days there was little mention of weekly or annual catches and there were plenty of low stock periods back in those days too. In the old days there was very little day let access too as most quality salmon beats were sold by the week for 6 rods which would have focussed the fishing effort much more than a single day rod let could ever have done. My take on this is catch stats theme is that you’re often better fishing water that has been rested and not commercially hammered every day of the week as the less salmon see of a fly the more likely they are to take it. Many beats that look good on paper could have ten times the rod pressure than a beat that’s catching half as many salmon with very little rod pressure. I also have known salmon beats that will keep fish catches off their scoresheet for various reasons so my advice is to not rely too heavily on this heavily flawed marketing approach. Much of the above comes down to a beat’s ability to market their water effectively and many are sadly not off the starting block in that department even though many do have outstanding salmon water to offer in this ‘global reach’ internet era. As a professional guide I’m always looking for the rested beats where you’re likely to get first onto the known hot spots and where you’re not having to share the water in the morning or afternoon with spin fishers which can be irritating to River Tay fly fishers at times. A professional salmon beat ghillie should in my opinion have separate areas set aside for spinning or only allowed in higher water conditions when the spinner works best. Fly fishers don’t like water that has been spun through and and spin fishers don't mind a pool having been fly fished previously so I’m always looking out for venues that understand the importance of this. This can be a challenge as many beat ghillies are not assertive enough and let their clients dictate beat operations way too much and often to the displeasure of other anglers. There’s a time when a beat ghillie needs to stand firm and not let clients diminish the fishing experience of other paying guests who like to fly fish. The only 'half way' compromise that definitely works is keeping popular fly pools free from spinning in the morning fishing session that way no fly fisher goes onto a pool in the afternoon that's been bombarded with spinners in the morning. If salmon get too heavily fished for they will completely go off the take and most of us have seen pools full of holding salmon that will not cooperate which is often a direct result of over fishing. With this in mind salmon pools should be rested and not bombarded in low water conditions when salmon are holding in large numbers and not running the river. An hour or two in the morning & afternoon in a situation like that will produce more results than an 8 hour multi approach continual bombardment and will keep the following day’s guests in with a fair chance of success too. Look for that pre-boiled kettle when you arrive on a salmon beat as that’s often the indicator you need to see how serious the beat ghillie is or not about his profession. I would say that’s the best early initial indicator of all and if the kettle isn’t ready there’s diminished chances the beat or its daily operation will be. Your spare time is important to you so the last thing you need is a ghillie turning up late or being way too negative about your chances of catching salmon. All too often a beat ghillie will diminish the chances of a client’s return without even realising his mistakes whether it be uncut riverbanks or too much general negativity. A true professional beat ghillie will be on the ball and one step ahead of the game with an enthusiastic & detailed plan of attack that makes sense to you. This enthusiasm goes a long way to getting hold of a fish as it will keep you going all day unlike the other approach. When you look around on a beat that’s managed by a true professional you’ll see all the signs like cut riverbanks, trimmed bushes, log shed full & freshly painted boats. Even a clean vehicle can be expected from these men who understand exactly how to deliver their profession correctly.